Day labels are used widely in the area of food management and in conjunction with quality management systems. The use of DAY LABELS helps to ensure food safety by enabling management of food serving and rotation. The day labels also promote the freshness of food to customers and also comply with food safety legislation. Optional extras include cardboard dispenser boxes and a plastic label holder which can be wall mounted and hold labels for each day of the week. In addition the labels can also be dispensed using a dispensing tool enabling quick and easy application. Container deposit legislation (CDL) in South Australia requires that a range of beverage containers include a 10c deposit which must be included in the retail price of the product and be refunded when the container is returned to a collection depot. Alcoholic beverages covered in the legislation include spirit based beverages, beer, ale, stout, spirit based beverages and alcoholic beverages up to and including 3 litres in size which are derived from the fermentation of fruit. In order to facilitate retailers and wholesalers in the application of a label to display the availability of the 10c refund to customers, Gleeson Agencies now have a pre-printed 10c refund label that can be easily applied with the aid of a label dispenser. It makes the application quick, easy and is very economical. Queueing Tickets for the Meto Queueing System are availale from Gleeson Agencies in both the T80 and the latest M90 versions of the Meto Turnomatic Queueing System. The tickets form an essential part of the success of using the system and allow customers to be served in their turn. At the same time whilst customers are waiting they know they have the time to browse at all available products in the vicinity and there is a liklihood of and further sales than originally expected. So contact Gleeson Agencies for the T80 and M90 Turnomatic Queueing System tickets. Gleeson Agencies is happy to announce that thermal premium cash register rolls are now available. These Australian made high quality register rolls are offered at extremely competitive prices so contact Gleeson Agencies for either small orders or bulk orders. In order to assist our valued clients Gleeson Agencies has set up a Bureau Label Printing Service that allows us to print small and large print runs of labels for customers with a range of requirements at an economical price. Whether the need is for a barcode, a nutrition panel, ingredients labels or despatch labels or a variety of other labels that may be needed, Gleeson Agencies will be happy to assist you with your print label requirements. Meto, Jolly, Sato and Primark Pricing Guns and Date Guns from Gleeson AgenciesAs a major distributor of Meto, Jolly, Sato and Primark pricing guns, date guns and associated labels and with years of experience Gleeson Agencies is able to provide the pricing guns, date guns and coding guns as well as plain labels or preprinted stock line labels that are necessary for businesses to price and or date their products. Additionally there are coding guns available that will enable any business to quickly see the costs of their products without ploughing through paperwork or computer files. For a small additional cost labels can also be made to specification with company names enabling marketing businesses without enormous costs being involved. Meto security EM labels (electro magnetic labels) are reliable and can be applied quickly. Integration with a Meto security system ensures that products can be priced and protected all in one operation. A range of free price guns and date guns with either single line and two lines of print is available with the purchase of labels. Contact Gleeson Agencies for further details. Included in the JAC range of A4 labels are gloss white labels in a range of popular sizes including ovals, circles, squares and rectangles. For further information the JAC Laser Labels page outlines the available sizes. The range of JAC labels now available from Gleeson Agencies has been dramatically increased. This will allow their customers greater access to a wider range of products including CGT and A4 matte and gloss white labels as well as a vriety of shapes including rectangles, squars, circles and ovals. There are also some fluor colours included in the range. For more detailed information go to the laser labels page. "Compass Labels and Checkpoint Systems have reached agreement on the transfer of ownership and distribution of the Compass Hand Labelling business (including price marking and date coding machines, labels and accessories) to Checkpoint Systems, effective as of April 24, 2007." The range of price marking tools and labels now available to both Compass and Checkpoint Meto customers is therefore vastly expanded and as a distributor, Gleeson Agencies is well placed to offer their customers the full range of Contact price marking and date coding tools and labels previously distributed by Compass Labels. Seal Mate is a portable electric label dispenser that is designed to dispense small, clear, paper or plasticised labels. The Seal Mate is a light weight dispenser of only 1.55kg making it the ideal tool for manufacturing or retail outlets. The Seal Mate supports labels sizes of 15-70mm with a length of 10-150mm and an outer roll diameter of up to 120mm. Using the Seal Mate is an effortless application as the dispenser simply presents a new label once the previous label is removed. Meto alphabet coding guns allow users to print words on labels with their alphabet coding guns. 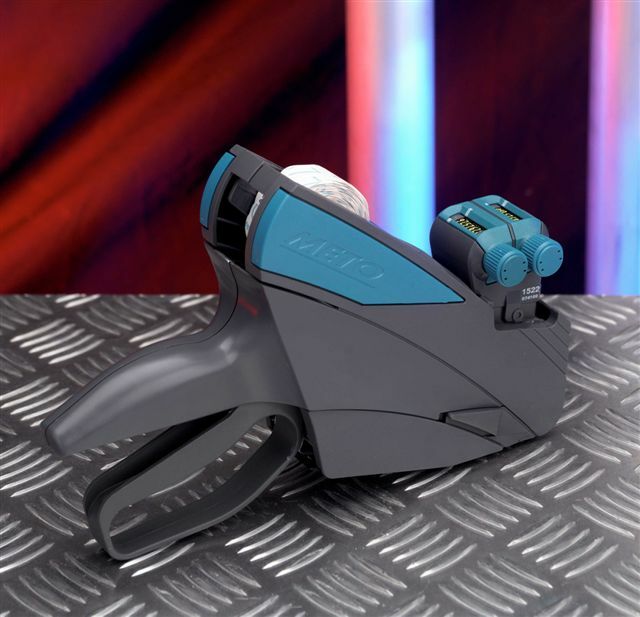 The labels can then be dispensed from the gun quickly and efficiently in the same way that a pricing gun label is dispensed. Standard alphabet coding guns have A-Z letters on each band on the top line and numeric bands on each band on the bottom lineof the coding gun. Many businesses require a combinationof lettering and numbers and Gleeson Agencies is happy to accommodate their customer needs by replacing alphabet bands with numeric bands or vice versa. This facility ensures greater flexibility and allows for wider applications of coding. In response to new labelling laws introduced in Australia and New Zealand, Gleeson Agencies are now able to provide Country of Origin labels with either Use By or Best Before also printed on the labels. ARROW synthetic polylaser labels available from Gleeson Agencies, are durable labels tht provide watr resistance. They can also be used on chemical drums. Polylaser labels can be used for many applications such as product identification, bar codes, address and despatchl labels and are available in A4 sheets with 1, 2, 14, 165,20 and 24 labels per page. Gleeson Agencies is pleased to advise its many customers who use tagging equipment that a new product is now available for tagging apparel. The Meto Fastening Tool has a unique loop system that enable delicate garments to be tagged without perforation. Tgs can also be applied to solid items such as luggage and sporting goods.